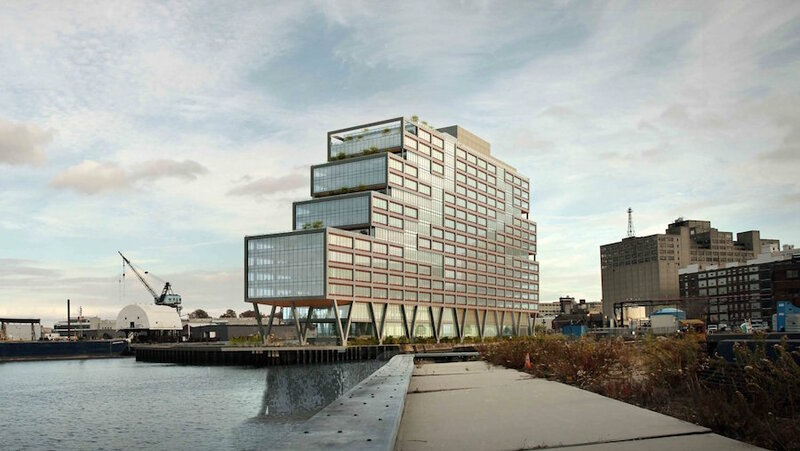 In the Brooklyn Navy Yard‘s latest development benchmark, the S9 Architecture-designed office building on Dock 72 has finally topped out at 16 stories over a year after it began construction. The building’s anchor tenant will be WeWork, a coworking organization which has committed to 220,000 square feet of the 675,000 square foot building. A portion of this space will also be dedicated to communal space programmed by WeWork, now well-known for its open-format office plans. These spaces will include a public lawn, a health center, a basketball court, and a conference center. S9 Architecture’s designs for the stepped structure are partially inspired by the shape of a boat hull, a reference to the Navy Yard’s past as a shipping hub. Its interior is informed by the organic, roving nature of ant farms, according to the architect, with split-level social spaces visible through the gridded glass and steel frame exterior. The building also features several outdoor terraces accessible through the communal spaces — in line with WeWork’s mission to create more community-focused work environments. WeWork will design all its own interiors, which have become a calling card of their branding. With homey couches, warm wall graphics and a focus on wood and copper textures, their offices often resemble hip coffeeshops more than offices, and almost all of them actually do contain a coffee counter with an ever-changing roster of public programming. Dock 72’s ground floor, supported by 20 V-shaped steel beams, will be designed by Fogarty Finger and contain the building’s dining facilities. The project’s topping out marks the next phase of a major new development for the Navy Yard, which will also include a Wegmans supermarket in the old Admiral’s Row building and a massive Green Manufacturing Center—the tenants of which are, in an unlikely coupling, a body armor manufacturer for the U.S. Military and a Marvel Architects-designed research and manufacturing space called New Lab. Marvel will also be working on the ground floor of one of the Navy Yard’s largest projects, Building 77, a one-million-square-foot structure bridging DUMBO and Williamsburg. Additionally, MAST Brothers Chocolate Makers and Brooklyn Brewery will be moving into newly renovated spaces within the 300-acre mega-development.